On December 15th, 2017 we had the joy of co-hosting an event for Los Angeles area influencers to celebrate the St. Jude Thanks and Giving campaign with Domino's Pizza. This year marks the 14th annual St. Jude Thanks and Giving campaign – created by Marlo, Terre and Tony Thomas, the children of St. Jude founder Danny Thomas – is an annual tradition with tremendous public support for the hospital’s lifesaving mission. Kicking off November 1st and running through the 1st week of January, St. Jude Thanks and Giving is an unprecedented union of celebrities, media, retail and corporate partners that ask consumers to donate while they shop to support St. Jude. Thanks to the support generated through partner campaigns like St. Jude Thanks and Giving, families never receive a bill from St. Jude for treatment, travel, housing or food—because all a family should worry about is helping their child live. This holiday season, we give thanks for the healthy kids in our life, and give to those who are not. Join St. Jude and Domino’s in fighting childhood cancer. Agradece la salud de tus niños y ayuda a aquellos que no la tienen. 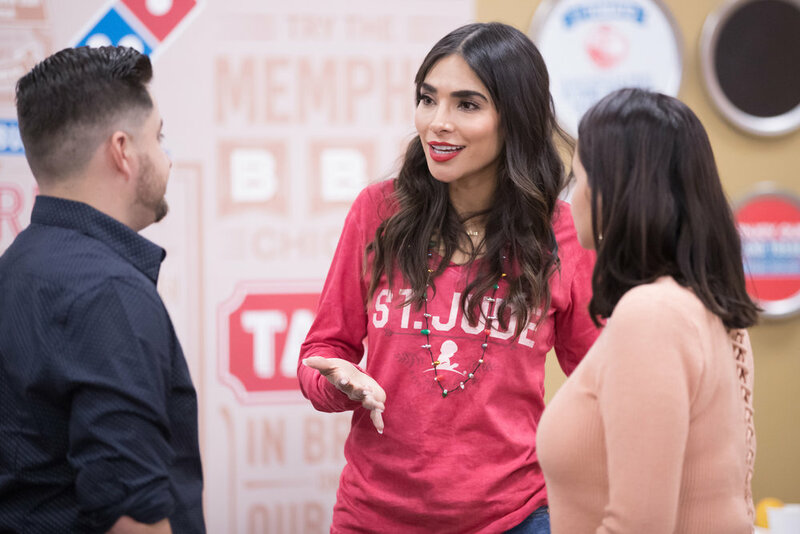 Domino’s Pizza, a 14-year partner with approximately 5,245 participating locations, has raised more than $38 million for St. Jude primarily through its participation in the St. Jude Thanks and Giving campaign. Domino’s led the way in raising funds in 2016 by raising a company record of $7.3 million for the kids of St. Jude by featuring a special St. Jude Meal Deal during the campaign, which included a $1 donation to St. Jude. Domino’s unique online ordering system resulted in a significant increase in online donations. 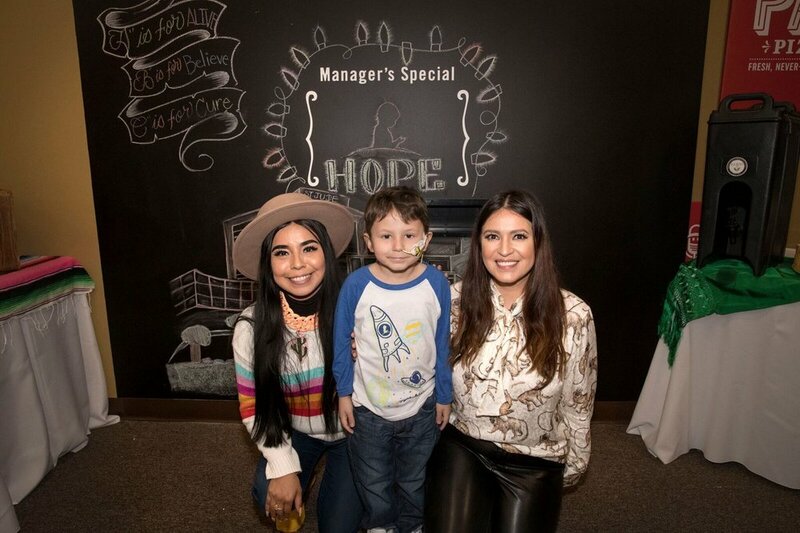 Not only did attendees learn about St. Jude and Domino's partnership via the Thanks and Giving campaign, but they also got to meet Lucas, a 5-year old patient from Chile being treated at a St. Jude hospital in California. Lucas and his family reminded us that every single dollar does make a difference since they are living proof of it. 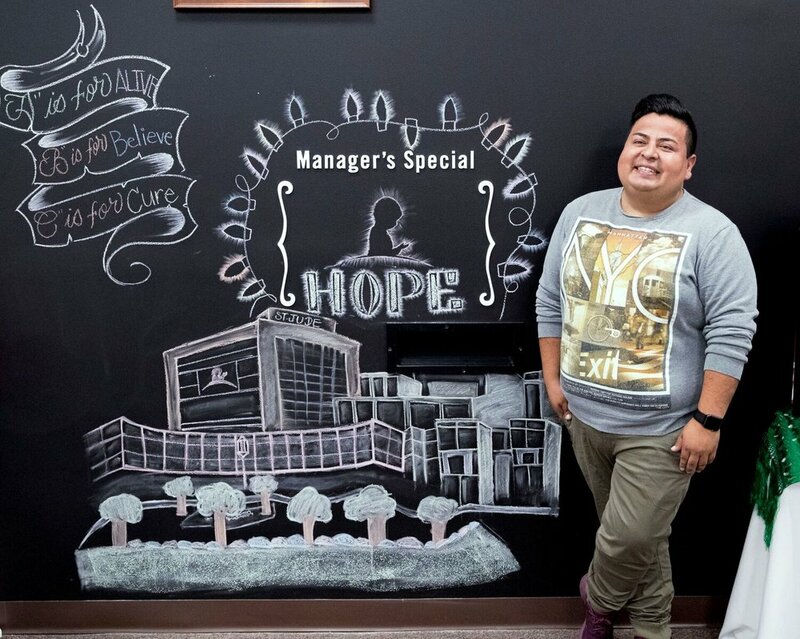 Celebrity Alejandra Espinoza sat with Alex Flores, manager of Hispanic/Multicultural marketing St. Jude Children's Research Hospital, for an emotional chat about why she passionately supports St. Jude and how cancer has touched her family's life. You can watch her full interview below and donate to St. Jude via her fundraising site here. Follow #DPZgivethanks on Instagram for more. One thing I’ve learned about entrepreneurship in the last 8 years of running my own mission-driven and self-funded business is that it takes more than the hustle and the passion to truly sustain it for the long run. 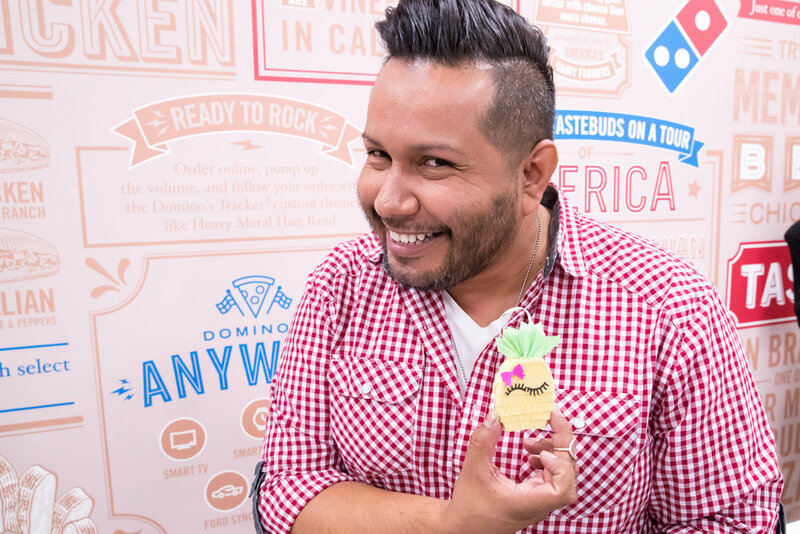 Unilever brands are celebrating the diversity and style of U.S. Hispanics with their new #100PorCientoTu campaign that promotes self-expression and individuality. Latinos are trendsetters, who believe that their personal style is their unique calling card. With #100PorCientoTu, Unilever is merging two Latino passion points – music and style – to inspire them to be their best selves, always. On March 3, 2016 Unilever launched their campaign with a VIP event followed by a Nicky Jam concert at Madison Square Garden. Some of our NYC influencers were invited to attend and even got a meet and greet opportunity with Nicky Jam himself! Glam Dapper, Nicky Jam and The Style Boro. Styled by Suzy, Nicky Jam and Sweet Style by Melissa. For more on #100PorCientoTu visit www.100porcientotu.com. #LatinaCreators came together last Saturday for a brunch with Orgullosa to celebrate Hispanic Heritage Month. Over twenty influencers gathered at the Four Seasons Hotel in Beverly Hills for a morning of connecting and celebrating. In between mimosas, a delicious breakfast and coffee, the conversations revolved around how we honor our heritage as Latinas through our various channels. Special guest, TV personality and actress Julissa Bermudez, spoke on being bicultural and how she toggles between both worlds embodying what a Nueva Latina is. Julissa shared how she, as a nueva latina, carries a unique story made up of rich history, blended cultures and aspirations. Born and raised in NYC, Julissa grew up in a Dominican household and is extremely proud of where she comes from and of her traditional values. The event highlighted how we as Latinas are defining a new blended cultural life that is unique. Orgullosa also created and produced a video series that aims to show the diversity of the Hispanic experience and celebrate Latinas who are proud of their culture, traditions, beauty, family, home and who are, of course, just proud of being Latina! The video series features four inspiring bicultural Latinas: Dascha Polanco who is and actress on the popular show OITNB, Jeanette Kaplun who is the founder of Hispana Global and fellow #LatinaBlogger, Laura Gomez who is a tech entrepreneur and Maria Teresa Kumar who is President & CEO of Voto Latino. Orgullosa knows that bicultural Latinas toggle between their Hispanic cultural upbringing and their American life experiences. Check out the series of videos below! Currently #LatinaBloggers and #LatinaCreators are also sharing their stories during Hispanic Heritage Month. Follow along with the #InspireOrgullo hashtag! We recently attended Altitude Summit's 9th conference in Salt Lake City, Utah. It was everything we expected ALT to be - creative, inspirational, lively and fun! We love when a conference leaves no stone unturned when it comes to details. And ALT delivered on every front when it came to making everyone feel like they were part of something special and that includes the announcement of coLAB. coLAB is collaborative project between three communities - Latina Bloggers Connect (that’s the L), Alt Summit (that’s the A) and Blogalicious, (that’s the B). We’re all teaming up to cross connect our communities and share ideas! Alt Summer attendees, Latina Bloggers Connect and Blogalicious attendees can opt into this program and will be partnered with a member of the other community. Together, partners will come up with a fun, collaborative project (large or small) and share their creation across their platforms. Some of these great projects will be feature on Alt’s social channels as well! Engaging in specific collaborative projects (perhaps 2 takes on the same DIY, or two essays on a related topic), that would be presented on both participant’s blogs and/or social media outlets. Introducing and interviewing each other on corresponding sites or social media to highlight each partner and what they have accomplished in their own community. Consulting with each other on how each of you have achieved brand growth, what has worked, what has not worked, sharing information about blogger-friendly brands and contacts, and engaging in a conversation about the future of blogging as a business. Creating a project (artist/crafter) sold on another partner's site (shop owner). If you’d like to participate, please fill out this Latina Bloggers Connect coLAB form. by June 20th. We would like to get this going by the end of the month! Last month, our Los Angeles, New York and Miami #LatinaBloggers were invited to a luncheon event sponsored by Tylenol® and hosted by Dr. Aliza Lifshitz. The ladies got to experience an afternoon full of blogger friends, delicious food and wonderful talk about how to keep their family healthy during these colder months. Part of the event was to learn about The Children's Health Fund mobile clinics for disadvantaged children and all the wonderful things they are doing for families across the country. To learn more about Smiling It Forward and The Children's Health Fund check out the following posts. "At this brunch, we had a chance to pick the brain of an expert and boy did we. She gave us some great tips on how to keep our babies healthy and we even got to ask her about all those "old wives tales" and myths our abuelas told us. It was great!" 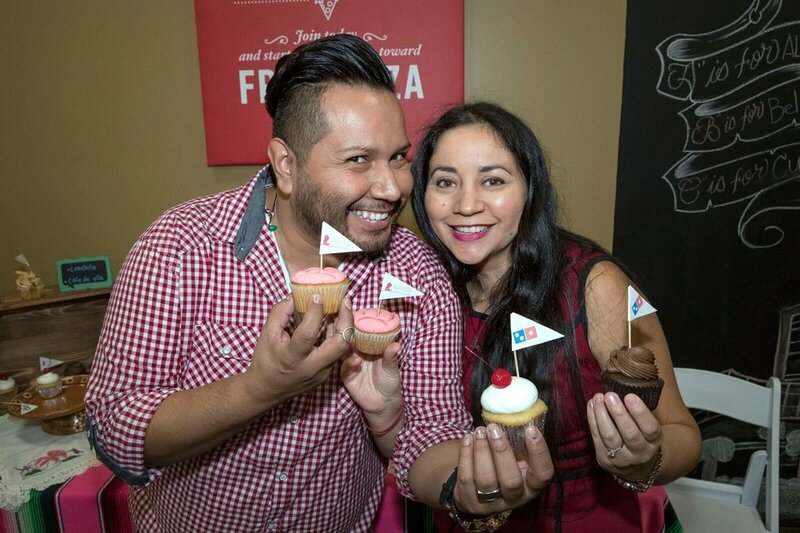 "Last week I was invited to the TYLENOL SMILING IT FORWARD Sobremesa event with Dr. Aliza, a renowned physician and founder of Vida y Salud. 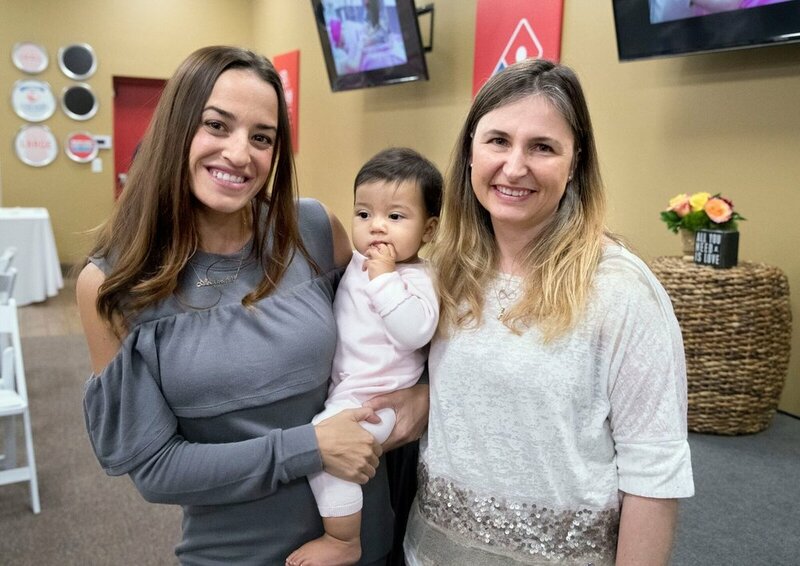 It was a brunch style event with several bloggers where we got to learn and ask questions on how to keep our little ones smiling and healthy through the cold and flu season." "Unfortunately, not every child in this country has what really should be basic medical care; thankfully, Tylenol is doing their part. We all can too. By supporting Children’s Health Fund, Tylenol can help bring smiles to the thousands of undeserved children who receive high-quality healthcare via their fleet of over 50 mobile medical units across the country." "And all this is possible through The Children's Fund and Tylenol is one of their advocates who provide the funds needed to make this amazing cause possible." "I think this is such a wonderful program. There are so many children in need (even those with working parents) who just can't afford proper healthcare. Now these families can visit one of these "doctor's office on wheels" and take care of their kids." "La detalles decorativos y arquitectónicos del lugar dieron pie a un almuerzo muy ameno con las compañeras blogueras. Estuvimos conociendo más a fondo el porqué blogueamos y cuál es nuestra visión. Un momento lindo para ponernos al día y sincronizar nuestros pensamientos en nuestras familias y la comunidad que se nutre de la información que le brindamos." To read more about Tylenol® and Smiling It Forward follow #SmilingItForward. Recently Latina Bloggers Connect along with Pantelion Films organized a special screening of the much-anticipated biopic of the great CANTINFLAS. #LatinaBloggers in the Los Angeles area were invited to view the film and even got to enjoy a surprise appearance by the lead star of the movie, Óscar Jaenada, whom really brings to life in an uncanny way the iconic Cantinflas. The film tells the story of Mario Moreno, better know as Cantinflas, one of Mexico's all time greatest and most beloved comedy film stars. From the humble beginnings that inspired much of his work to his days in Hollywood, the movie tells of his many triumphs and struggles stirring up tears and much laughter along the way. After the movie, attendees enjoyed margaritas and lunch at Loteria Grill. Fashion, food, beauty and lifestyle bloggers alike all joined in spreading the word about this special film with something for all audiences to enjoy. We hope you see CANTINFLAS this Friday, August 29th and love it as much as we did! #LatinaBloggers all accross the states were also invited to view the film so follow the #CantinflasMovie hashtag on Twitter and Instagram to join the conversation! Check out what Carmen of Latino Fit Club , Diana of LadyDeeLG and Xenia of Raised by Culture have to say in their posts! "It's always a treat to see the lovely @carmenmelgoza, but it's double sweet with Cantinflas in the picture! No pun intended." This month Latina Bloggers Connect was in Texas talking to some amazing mom bloggers about how they #SayAdiosToDiapers with Pull-Ups® training pants. Our first stop was San Antonio on Saturday, April 26th where the beautiful Jeannette Kaplun, met us for tasty Mexican food at La Fogata with nine of San Antonio’s best Latina Bloggers. We shared tips and tricks about their experiences potty training our children. We talked, we laughed and realized no mom should ever be alone when going through this phase. Next, was Houston’s Churrascos on Sunday May 4th where Jeanette Kaplun once again hosted a delicious luncheon with some of Houston’s best Latina Bloggers. We bonded over tres leches cake and talked about how no two kids are the same, especially when it comes to potty training. We even had time for a group #selfie. Each blogger received a goodie basket full of Pull-Ups® training pants and a The First Years Disney Potty. Follow #SayAdiosToDiapers for potty training tips from some of our Texas Latina Bloggers. Disclosure: This post is sponsored by Crest 3D White Whitestripes Awards season kicked off last week in Miami with the 2014 Premio Lo Nuestro Awards and you better believe I was right in the middle of the action on the Red Carpet, lista to catch a glimpse of my favorite artistas and celebrities. From Luis Fonsi to Diego Luna, estrellas from TV, film, and música all descended on Miami for a night to celebrate the best of the mundo of Latino entertainment. Since I was going to be on the on the red carpet, en medio of all the stars, and taking over the LBC Instagram account for Crest 3D White Whitestrips, I made sure to have my #SmileStyle at 100%....hair done, fancy dress, and a big sonrisa gave me the confidence that I needed to chat up some of my favorite artistas that evening. 1- Getting to walk the red carpet...it siempre gives me such a rush! How do you like my #SmileStyle? 2- Snagging this priceless pic of Pedro Moreno, Mane de la Parra, Lilli Estefan, Alejandra Guzmán and Fanny Lu in the garage as they walked into the Premios. Sometimes the best #SmileStyle moments happen away from the red carpet...you just have to be ready! 3- Gazing in awe as Enrique Iglesias chatted with us backstage at the Premio Lo Nuestro media room. ¡Su sonrisa me fascina! 4- Interviewing some of my favorite new artists on the red carpet: Gretchen and Rigú. The newer artists are always a pleasure to chat with since you can tell they are so excited to be at the Premios. Also...they were rocking that #SmileStyle! 5- Grabbing a quick selfie with el guapo Diego Luna. I'm not going to lie, during that moment, I felt like a giddy middle-school girl. I don't think my sonrisa could be any bigger! What was your favorite momento of the noche? Which artist do you think rocked their #SmileStyle the most that evening? We want to hear from you! I had a blast at Premio Lo Nuestro and gracias a todos who followed along with us as we live tweeted our experience and the best #SmileStyle from the event. Por favor, stay connected with Las Gringas Blog for the latest Latino entertainment news and toda la farándula desde Miami! Find us on Facebook, Twitter, and Instagram! Last week we hosted one of our LBC Live Parties for L.A. #LatinaBloggers at Lucky Strike in Hollywood to spread the word about AT&T's #ItCanWait campaign to take the pledge to never text and drive. While the event allowed us to get together and have fun, our purpose was to shine light on how truly dangerous texting or even just checking out phones is while driving. Although we may feel comfortable multi tasking, as most of us bloggers do, we pledged to say #ItCanWait because our lives and the lives of others are too important to risk over a text message. As we took our bowling balls and rolled with careful aim for a strike, we were reminded of how some things require our full and undivided attention. Check out the event photos on the Latina Bloggers Connect Facebook page and share your reasons why texting and driving can wait on Twitter and Instagram with the #ItCanWait hashtag. Let's keep the message rolling! #LatinaBloggers Attend Screening for "Instructions Not Included"
Pantelion Films and LBC teamed up to put together a very special and private event for Los Angeles Latina bloggers to screen the bilingual film Instructions Not Included, starring one of the most recognizable Mexican actors, Eugenio Derbez, and newcomer Loreto Peralta, who we guarantee you will see more of in Hollywood. The event was so special, that the two stars showed up for a special meet and greet with the blogueras. Without giving too much away, the film will make you laugh and cry simultaneously with its heart-felt story line and humorous take on bachelor-turned- dad dose of reality. Although the norm for many of us, the film perfectly integrates what it means to be bi-cultural and bilingual flawlessly into the story line. The film is a dream come true and a 10 year venture for the actor, director and producer Eugenio Derbez. He spoke with the audience after the film and shared his thoughts about the importance of family and bilingualism. Confirming what we already know, he strongly believes that speaking English and Spanish is both beneficial academically and in the work place. It was also a dream come true for many #LatinaBloggers who have been long time admirers of his work to see Eugenio's vision come to life and share in the moment with him . Loreto Peralta equally stole the show with her performance as Eugenio's sweet, imaginative daughter. She will steal your heart, we promise! Instructions Not Included opens in select U.S. theaters this Friday, August 30th. You won't want to miss it. To see you more pictures, check us out on Facebook and Instagram. #LatinaBloggers are everywhere and we love it! We're working hard, traveling, managing our homes and caring for our families. With so much to do, it's very important we take care of ourselves and give our bodies the healthy fuel it needs to keep going. We were beyond excited to work with AMWAY's Nutrilite on inviting a group of Latina bloggers to New York City to learn more about the benefits of healthy eating, a fitness routine and supplements from optimal health expert Dr. Kip Johnson, fitness expert Sean Foy and nutritional scientist Dr. Micheline Vargas. We also managed and hosted a Twitter Party with fellow bloggers Angie Martinez of Little Inspiration, Bren Herrera of Flanboyant Eats, Jeannette Kaplun of Hispana Global and Lynda Trujillo of Hit the Road Jane. It was such a huge success that we reached over 19 million impressions and hit the #2 trending spot in the U.S.! Not only did we tweet the night away, we learned how to #PackMoreHealth into our daily meals by way of color with renowned chef Rick Bayless. Want to maximize health benefits? Is Phytonutrient protection, energy, weight control, mental health and variety a concern? Divide your fruits and vegetables into five color categories - red, yellow/orange, green, blue/purple, and white. Strive for two servings from each color category daily and eat between 9-13 servings a day. Play around with herbs and spices, visit your local farmer's markets more often and break the habit of relying on your go-to color (Assess your current intake of color). Cooking with color is a very simple concept to follow. It just takes a little planning ahead and a basic understanding of flavors. For example, according to Chef Rick Bayless - Some greens are very bitter, so it's important to smooth out the taste. To sweeten it up, just add onion. He prepared a Swiss chard taco with caramelized onion, fresh cheese and red chile. It looked and smelled amazing - and it really did not take very long to pack all we need into one dish. Time is such a factor for us all. However, it really doesn't take that much time at all to steam or saute fresh veggies, and have that as a snack throughout the day. Nuts, walnuts and peanuts are also great for those of who like a little crunch. Oh, and who doesn't love a nice refreshing smoothie as a treat? And to make up for what you may miss, don't forget your supplements and drink plenty of water. However, before you do any of this, it's important to start your day with a healthy breakfast. Don't just rely on your favorite cup of cafecito to get you through the morning! To learn more about cardiovascular health, healthy aging and the benefits of photonutrients, visit Nutrilite and like them on Facebook. We would like to thank Nutrilite for such an amazing experience, the wonderful bloggers who joined us and to all those who participated in the #PackMoreHealth Twitter Party. Now let's take all that we've learned, and put it to use in 2013! To see more pictures, visit us on Facebook, Instagram or Storify! 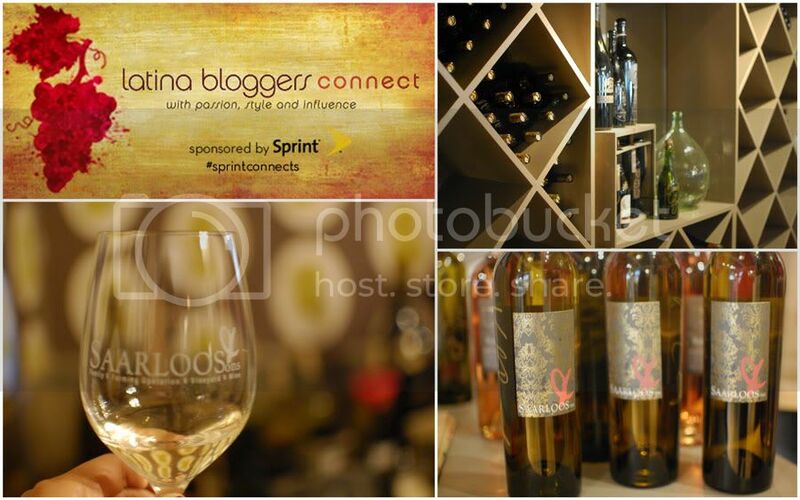 Last weekend LBC and Sprint hosted an intimate all-day event with Los Angeles area Latina bloggers with the only motive of connecting and spending an amazing day of bonding over new experiences. The 15 invited bloggers all got the chance to meet the Director of Hispanic Marketing for Sprint and have real life conversations during the two hour drive to and from Los Angeles to the quaint town of Los Olivos in the Santa Ynez Valley of California, famous for being the location where the movie "Sideways" was shot. Our first stop was the Fess Parker Winery where we got a tour of the grounds and a private wine tasting in their Wine Club Lounge. We all got a kick out of learning the winery was owned by the same man Disney made famous as Davy Crockett in two movies in the 1950´s. 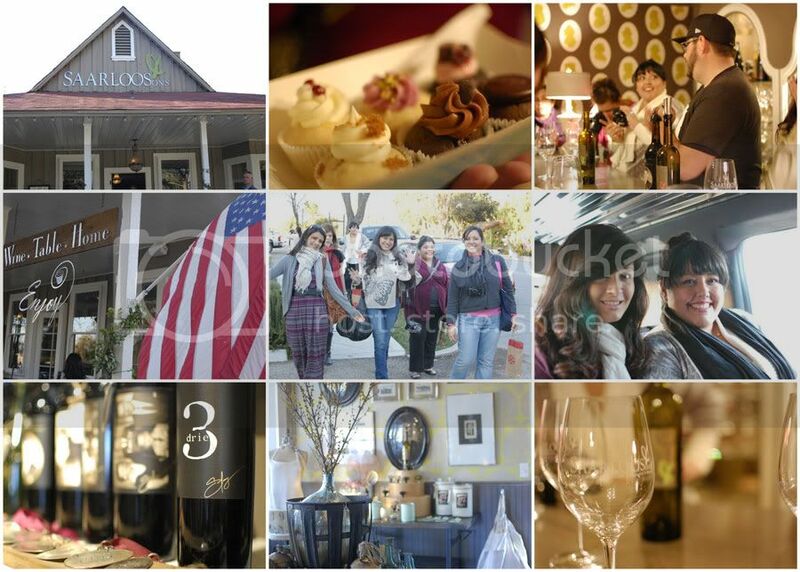 We also bonded over Viogniers, Syrahs, and some of the best wines the area has to offer. 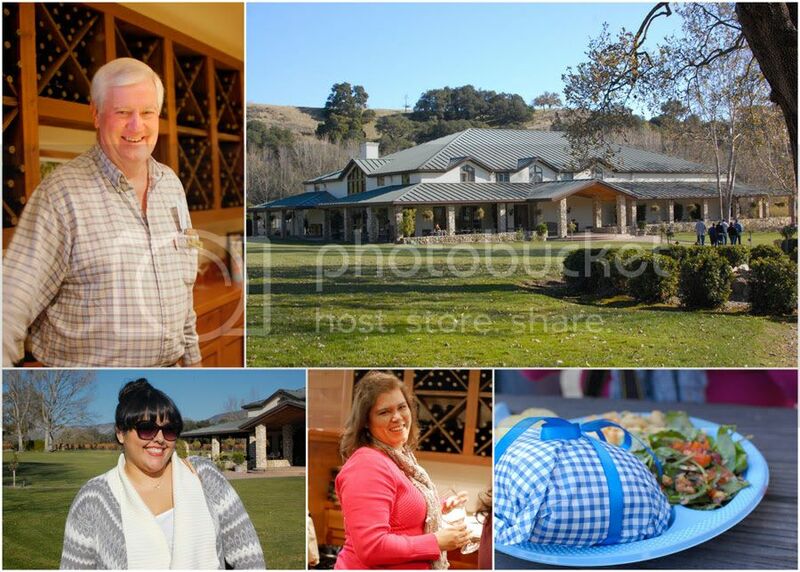 The wine tasting was followed by a very special picnic lunch catered by Latina food bloggers extraordinaire--Nicole Presley of PresleysPantry.com and Ericka Sánchez of NibblesandFeasts.com. The bagged lunch included these choco-mint Christmas cookies and these peanut butter and jam cookies. Yes. It was a feast of great food, wine and amazing friends. 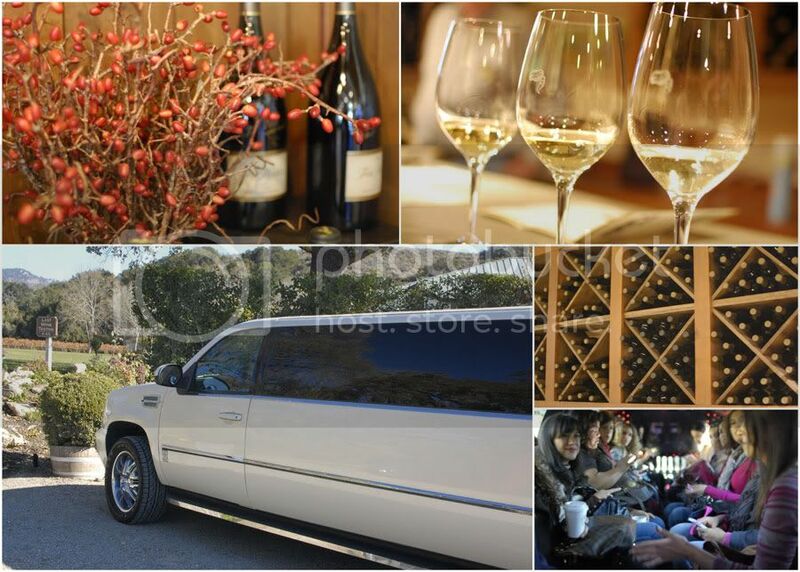 Then we got back in the limo to head out to Saarlos and Sons, the most unpretentious wine tasting room you´ll find in the area. I mean, who else can dare to pair up wine with cupcakes?! We had the cool back room all to ourselves, where we delighted on cupcakes from Enjoy Cupcakes, rocking music, divine wine and funny stories from Keith, one of the Sons. After some free time exploring the town of Los Olivos on our own, we drove back to Los Angeles and relished in the memories and bonds formed on a beautiful California day while playing some games the fabulous Monique Frausto of ClickLatina.com had put together for us to get a chance to win some Boost Mobile phones and Sprint gift cards. One interesting note to observe is that the only ones in the group who were able to stay connected the whole time, without the need for Wifi, were those with a Sprint phone. Kid you not. For more beautiful pictures, taken by Rachel Matos of TheArtMuse.net, head on over to our Facebook page. The tweets on the #SprintConnects hashtag also speak for themselves. And a big heartfelt ¡Gracias! to Sprint for such an amazing gift and for truly getting the meaning of Connection.